We know that many Hubbers have a variety of interests. That’s why bios can be customized for any subject area. Like Hub Groups, there are two places to manage bios: the HubTool (great for on-the-fly Hub editing) and My Account (ideal for managing all bios and assigning them to multiple Hubs.) A lengthier explanation of how the feature works will be available in the HubTool Learning Center entry soon! Each account can have up to 25 bios stored at a time. You can delete unused bios and update existing ones whenever you like. Each bio must be a minimum of 80 characters long and a maximum of 140 characters long. This range exists to ensure that there is consistency in bio lengths across Hubs. Attempt to spam, e.g., use the space to ask readers to click on their profile or try to insert links—both aren’t allowed and a single offense is enough to hide bios across all of their Hubs. Place unrelated bios across several Hubs (e.g., the Hub is about surgery, but the bio is about baking cookies). Place generic bios across several Hubs, where the bios are not useful to readers. Place bios with many grammatical and/or mechanical errors across several Hubs. Place nonsensical bios with the intent to troll across several Hubs. Furthermore, it is important to use this tool responsibly and not mislead readers into thinking you are an expert on something you are not. As we all know, some topics are less serious (e.g., cats wearing hats) than others (e.g., brain surgery). For bios that don’t require a high level of specialization, feel free to write whatever you think demonstrates your credibility on or enthusiasm for the subject and use proper formatting. Bios should be specific but concise. Be honest about your qualifications and interests. Bios should be written in the third person, i.e., “Stacy graduated from Harvard Medical School in 1987,” not “I graduated from Harvard Medical School in 1987.” We recommend using your real name or a pen name rather than your username, as it is more professional. Complete sentences are strongly preferred. Also, don’t ask questions. A bio should match the topic of a Hub. Don’t say you’re a dog trainer on your chocolate chip cookie Hub. Don’t include information about yourself on topics unrelated to the topic of the Hub. On a Hub about anything: “Please visit website MyTravelSamsNStuff” — this bio is purely promotional and trying to skirt our rules against linking. On a Hub about Skyrim or other video game: “Allen has been playing this game for many years.” — this bio isn’t specific enough or make sense in context. What game has Allen been playing? On a Hub about anything: “Hi. Do you like my Hub? I like you. Please click on my profile above!” — this a troll bio that is also promotional. On a Hub about a complicated medical procedure: “I like keeping up with the latest medical devices.” — this bio does not demonstrate enough credibility for a topic that requires a high level of specialization. On a Hub about anything other than cats: “Hi, I’m Paul. 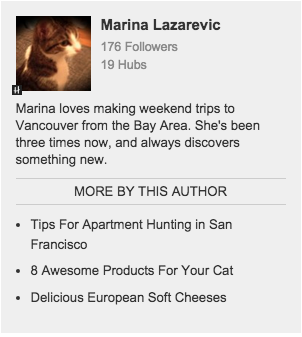 I live in Berkeley and have two cats.” — this bio is too generic to be of use to readers. 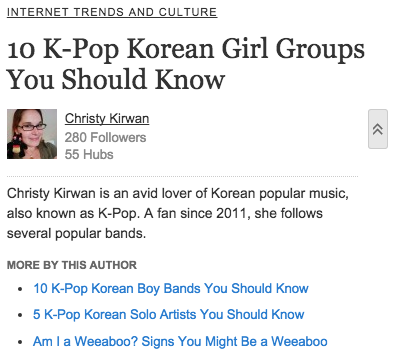 This type of information is better suited for a Profile bio rather than a Hub bio. That’s it for now! Over the next few weeks, be on the lookout for About the Author! Very exciting news. Eagerly waiting for the launching of this new factor by our hubpages admin. How generic is too generic? If Sally writes about European travel, and has a hub about visiting a spot in France in particular, can she use a bio that says “Sally has traveled extensively throughout Spain, France, Belgium and Switzerland.” or does Sally need to make the bio specific to France? If Stacy is a high school physics teacher who writes about topics in high school chemistry, physics and biology, can she use a bio that says she is a high school physics teacher? Science teachers are educated in other areas of science besides the one they are assigned to teach in. Also, how will this affect hubs on medicine and health that are not written by doctors? Especially hubs with very bad information and wrong facts? Anyone can say he is a doctor on Hubpages. Regarding generic bios, the two examples you mentioned (European Travel and Physics) both work fine because they speak to the topic of the Hub(s). We just don’t want Hubbers to write general personal information in their bios like where they’re from, their age, or anything else that’s too broad to be of interest to outside visitors. I will say that, if your France Hub is one of your best performing Hubs, it may be worth it to write a bio specific to France since that bio will be visible to more readers (most of which are more interested about traveling to France rather than other places in Europe). Anyhow, consider the above as tips rather than rules – we want you to make the most of your bios, but as long are you are well-intentioned and follow the general guidelines, your bios won’t be hidden for being a little broad. Regarding health and other medical topics, it’s a great idea to write a bio from a patient’s perspective (current or former). As for people that lie about being doctors, we’ll have to see how this goes. We reserve the right to hide bios on any account (including ones we believe are harmful to readers). I strongly suspect that people who will abuse bios are already abusing the HubPages platform in some other way. In other words, we should see clear patterns of abuse. This is a great feature! Like you mentioned, I have been using text capsules for this, and cannot wait for this update. Dreamhowl, I looked at some of your bios while working on this feature. You’ve done a great job of tailoring bios to the topics of your Hub and I’m excited to see them in the new format! So then are our profiles going to be deleted? Author biography is one of most important for any person who want to know about person who write the blog or article,you give great Idea about how to write perfect author biography for any site and blog. I like the idea of custom bios but I also feel uneasy about the suggestions for use, with the strong emphasis on only formal expertise and certifications. Will we continue to be able to publish on topics we do not have college degrees related to, or will life experience and independent research still allow us to publish on topics we have purchased no certifications for? Thank you for sharing the information in regards to biography hubs. I hope is to improve my ratings on my first hub about coconut health benefits. Thank you! Thanks for this opportunity and I hope we will soon find out when we can post our bio’s to this new hub feature.